We've already made a lot of fun of the BMW 2-Series Active Tourer. It's the Ford C-Max with a posh badge. That's not the biggest deal, though. This is the first front-wheel drive machine with a BMW logo on the front. Take a deep breath. Never mind that "active tourer" sounds a little like a yoga mat. Get used to more FWD BMWs in the future – and some of them might be swankier to look at than this. But the 2-series Active Tourer, which officially debuts next month at the Geneva Motor Show, looks like it's going to be a practical and stylish package. The interior shares a lot of current BMW cues, although it looks like there's more shelf and cubby space than in a 2-series coupe, for example. Let's forget the whole BMW naming scheme is screwed up. 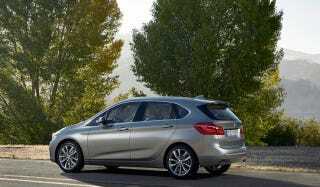 But speaking of the 2 coupe, the top-range 225i Active Tourer will carry the 2.0-liter turbo four from that car. For people who think their Active Tourer doesn't look active enough, there will be an M Sport package available. No official word on U.S. availability, yet, though. BMW's North American execs have been eager to bring this car to the States, though. They might as well. Don't you picture this becoming a staple outside of a Starbucks that's two doors away from the Pottery Barn that's across the way from a Lululemon?